Visual harmony adds to the appeal of your Master Planned Community. Coordinate your traffic and directional signage with your outdoor lighting and residential mailboxes. Turn your housing plan into a detail oriented, upscale development with traffic sign frames and back plates for a custom street signage system. Find brackets and mounting hardware, including vandal proof bolts, for these frames and plates. Special Lite Products also sells DOT Traffic signs as well as custom directional signage. The image on the right shows the effective use of coordination in a master planned community. The traffic sign, mounted in a frame, is on a post that coordinates with the nearby light post, adding curbside appeal to the neighborhood. Back plates are made of .080 flat aluminum. Measurements for the back plates are for the sign blade going onto the back plate. Back plates are oversized to provide a 1" wide border on all sides. For example, BP24-OCT is actually 26" wide, allowing for a 1" border around a 24" octagon sign. The traffic back plates come undrilled for custom mounting. To order a custom back plate, use the item number followed by the height and width you need for your custom sign application. For example to order back plate for a 15" W x 30" H sign, the item number would be BP-1530. Measurements are for the sign blade going onto the sign trim. Sign trims are pre-drilled for standard sign mounting. To order a sign trim use the item number ST followed by the width then the height of the sign. 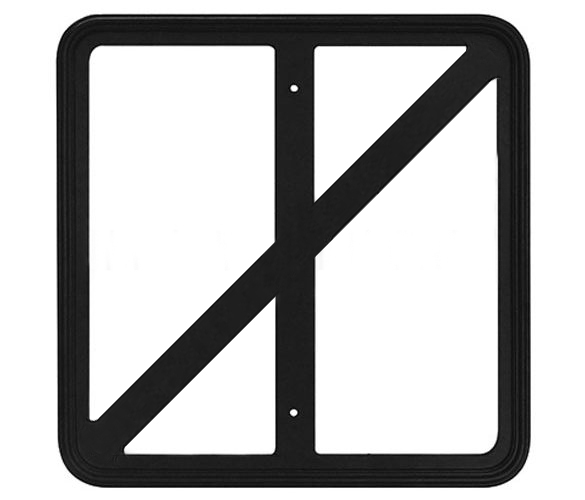 NOTE: Traffic sign backs come standard with a "mill finish" that shows through the backside of the open Sign Trim. We sugguest covering the back of the sign with black vinyl at a small additional charge for aesthetic reasons. Vinyl is not required when using Back Plates or Sign Frames. The measurements shown are for the sign blade going into the frame. Sign frames have a 1" raised framed edge on all sides. The sign frames come undrilled for custom mounting. To order a custom sign frame, use the item number SF followed by the height and width of the sign. For example, to order a frame for an 18"x30" sign, the item number would be SF-1830. Find brackets and mounting hardware, including vandal proof bolts, for these frames and plates.